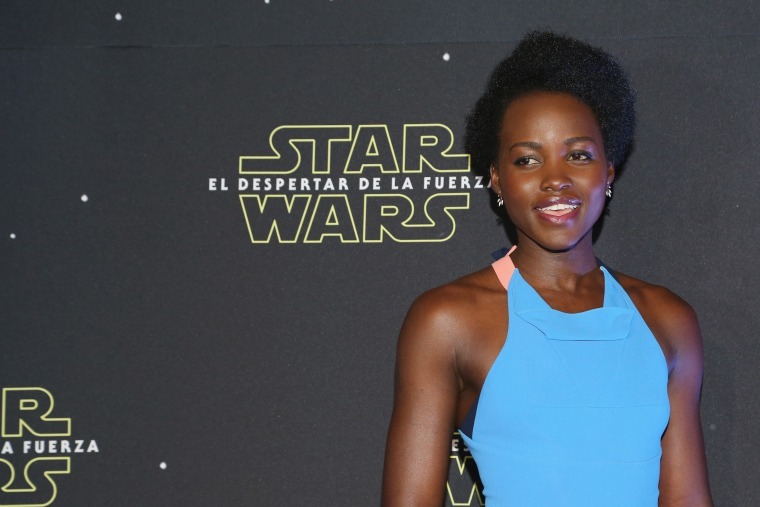 Lupita Nyong’o is quite literally running. She’s got an entire day set aside for interviews in anticipation of the premiere of “Star Wars: The Force Awakens,” wherein she plays a mysterious new character named Maz Kanata. She’s taken call after call and this one, in particular, takes place in her private car as she is being shuttled from place to place. Unless you’re in New York City and have recently seen her on Broadway, the rest of us haven’t heard much of Nyong’o since her Oscar-winning turn as the tragically beautiful and horribly abused Patsey in 2013’s “12 Years a Slave.” And concerning that role, Nyong’o is quite frank when it comes to the reasons why she took on the new challenge of fleshing out a computer generated character in a universe far, far away. That’s easy enough to understand. It had to be painful to embody Patsey. And Maz, a goggle-wearing alien who owns a nightclub and has her own special powers, is apparently central to the storyline – at least according to the movie posters featuring the orange creature off to the side. Nyong’o looked to the actor who portrayed Gollum in the “Lord of the Rings” series for inspiration. She didn’t think twice about taking on the challenge. The chocolate-hued beauty is now 32 years old. She’s a tad young to have seen the “Star Wars” saga at the theater for herself. But did catch the saga on repeats back on TV when she was around eight years old. She’s no a rabid fan in the way that many Americans might be. But one of her uncles is a tremendous “Star Wars” fan. He was super excited to see her cast in this new movie. But her mother? Eh. Not so much. At least, not until fairly recently. The actress recently has graced the cover of Essence magazine and Vogue. And outside of her work successes, people in the African Diaspora openly marvel on social media that she hasn’t gotten “caught up” in a skin-color obsessed Hollywood yet. In other words, she hasn’t bleached her skin or straightened her hair. Lots of fans appreciate that natural stance. That comfort oozes from her. She is not fazed when presented with the rants of racists who believe the “Star Wars” universe should be all-white. After all, in the original series, James Earl Jones voiced Darth Vadar and Lando Calrissian was played by Billy Dee Williams. She shrugs off the negativity of those who say that co-star John Boyega, a black Brit, shouldn’t have the Force within him.